You are probably aware of the proposals to build over a hundred flats (up to 8 stories tall) on the site ajacent to the Gunnersbury Triangle Nature Reserve. 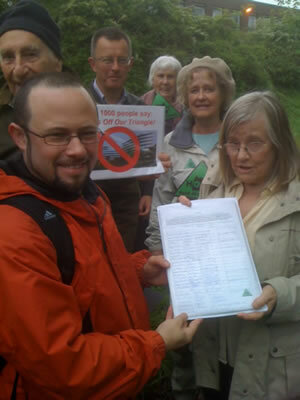 I handed in a wonderfully large petition (over 1000 signatures) last night to a senior Council officer. Thank you for all the residents who signed this. Your three local Liberal Democrat councillors are against this development due to the potential damage to wildlife as well as the likely negative impact on parking in local streets. Ealing Council's planning committee of Councillors is visiting the site so they can gauge the likely impacts of the proposed development. There will be a chance for residents to ask questions and raise points to the planning committee. This development is finely balanced and having more than a hundred residents present will really show them that our nature reserve is too important to risk. Please turn up at Colonial Drive (near the bottom of Bollo Lane) THIS Saturday at 10am. If you have any questions please contact Councillor Andew Steed by phone or email ( andrew.steed@ealing.gov.uk or 07736 649664). You can visit the HOOT Official Website here.